The Groove Music app, which you can use in Windows 10, lets you play your music collection and makes it easy to explore new music. Select the Groove Music app on the Start screen. The Groove Music app home screen appears, as shown. The Music app enables you to play songs that you ripped (copied) from CDs, songs that you purchased from iTunes and other music purveyors, and playlists that you created from songs you own. If you see Can’t sign in, you’re not connected through a Microsoft Account. You’ll still be able to do the steps in this section, though. You need to sign in only to buy music. Initially, the Music app recognizes music files kept in these folders on your computer: C:\Users\Your Name\OneDrive\Music and C:\Users\Your Name\Music. Maybe you keep your music files in other folders. To tell the Music app where your music files are, tap or click the Show Menu button to display menu options and select the Settings button. In the Settings screen, select the Choose Where We Look for Music link. The Build Your Collection dialog box appears, as shown. Select the Add Folder button, choose a folder in the Select Folder dialog box, and tap or click the Add This Folder to Music button. Then select Done. Repeat these instructions to add all the folders where you store music files. Search: Type the name of an artist, album, or song in the Search box. As you type, suggested matches appear below the Search box. For now, ignore these suggestions (but take advantage of them in the future to save typing). Instead, select the magnifying glass or press Enter. Search results appear. Your Groove: A list of albums you played recently appears. Scroll to find an album. Albums: A list of albums appears. Scroll to find an album. Artists: A list of artists appears. Scroll to find an artist and select the artist’s name to view his or her songs. Songs: A list of songs appears. Scroll to find a song. If the search results list is a long one, you can narrow your search with the Filter and Sort options. 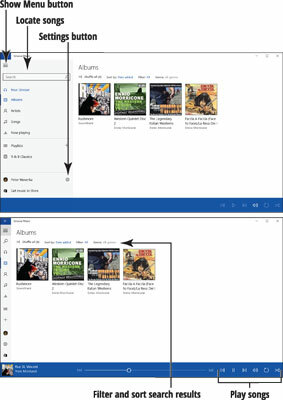 Filtering narrows the search results to songs on your computer, songs on OneDrive, and other criteria. Sorting arranges the results in alphabetical order, date-added order, or by genre, artist, or album. Play: Plays the song. Notice the controls at the bottom of the screen for pausing the song and controlling the volume. Play (Album): Plays the songs on the album, starting with song 1. Add To: Opens a pop-up menu with playlists, and you can add the song to one of those playlists. Explorer Artist: Opens a screen with other songs you own by the same artist. Click the back arrow to return to the Results screen. You can listen to music as you conduct a search. To return to the song or album that is currently playing, select the Now Playing button. Check the volume level on your speakers. Tablets and laptops often have physical volume controls — look around the edges. To adjust volume levels using Windows 10, select the Speakers icon on the right side of the taskbar. A volume slider appears, as shown. Slide the control to adjust the volume. Select the speaker icon on the right side of the slider to mute or unmute all sounds. Select anywhere in the Music app to dismiss the volume slider. Switch back to the Start screen. The Groove Music app continues to play. The Groove Music tile on the Start screen displays the album art and title of the current song. Select the Music tile to return to the app.